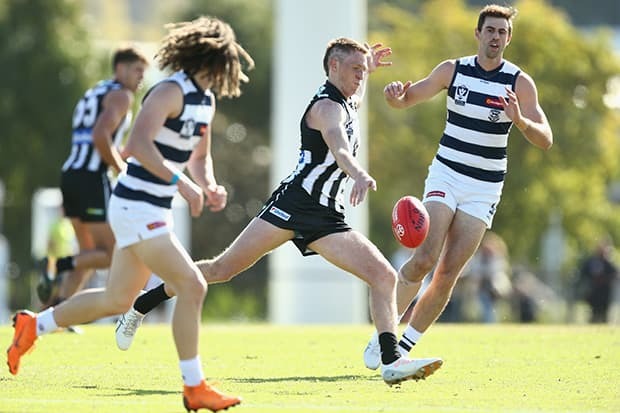 Nathan Murphy in action for the VFL Magpies against Geelong. Image: AFL Photos. Nathan Murphy is a patient person. The former cricketer only turned to football as a potential profession recently, yet now finds himself on an AFL list. He knows his time will come, but seeing fellow draftees Jaidyn Stephenson, Flynn Appleby and Brody Mihocek debut and impress on the big stage only makes him more eager to do the same. Until the time comes, Murphy has to wait his turn – and now has at least another two years at Collingwood to do so. “You just want to get in there and play straight away,” Murphy told Collingwood Media. “But there’s no rush to crack the seniors at the moment. Such is the raw talent of Murphy, he’s still not sure which position he will hone in on later in his career. At 188cm, he’s played in defence and up forward, and is yet to miss a VFL game this season. He took confidence from a round seven win over Coburg, and also impressed with a 20-disposal, eight-mark game against Werribee in round five. “It’s all educational for me this year,” he said. Day to day at the Holden Centre, Murphy has immersed himself in his new surroundings. He shaved his head with Steele Sidebottom for World’s Greatest Shave in March and drives to the club each day with emerging star Jordan De Goey. VIDEO: Murphy and Sidebottom lose their locks. Watch the veteran and young Pie embrace World's Greatest Shave. Life is good, and the decision to re-sign was an easy one. “To put pen to paper was all I really wanted,” he explained. “A lot of the top draft picks this year have re-signed really early. To be one of those guys feels really good. Murphy’s signature may not be the highest profile the club collects this year, but he may prove valuable in more way than one. The 19-year-old has tried his hand at recruiting his slightly older car buddy. “Jordy and I have become pretty close,” he said with a grin. MORE RE-SIGNING NEWS: Brown brothers are here to stay.